ALUMINUM (two variants) – directly linked to Alzheimer’s Disease and suspected in Macrophagic Myofasciitis & Chronic Fatigue Syndrome. Currently children are getting 17 shots containing aluminum, a quadrupling of the amount given since the 1970’s. It is found in Hepatitis A, Hepatitis B, DTaP (diphtheria, tetanus, pertussis), MMR, Hib, Pneumococcal & Gardasil (HPV) vaccines. Based on Dr. David Ayoub’s findings children, on average, receive 2-400 micrograms per vaccine, over a milligram of Aluminum; a concentration & dosage that is 10 – 20 times more toxic than Mercury. Multiple vaccines are far worse, over a 1000 micrograms on average for a triple set shot. Compounding the problem even more aluminum gets in during the manufacturing process. An indicator that the tools and/or machinery used are not properly monitored for safety. Currently children are getting 17 shots containing aluminum, a quadrupling of the amount given since the 1970’s. It is found in Hepatitis A, Hepatitis B, DTaP (diphtheria, tetanus, pertussis), MMR, Hib, Pneumococcal & Gardasil (HPV) vaccines. BETA-PROPIOPACTONE – ranked as one of the most hazardous compounds (worst 10%) to humans and “reasonably expected to be a human carcinogen” (International Agency for Research on Cancer – IARC, 1999). EGG PROTEINS – includes Avian Viruses. FORMALDEHYDE – used as “a preservative & disinfectant”, can cause proteins to irreversibly bind to DNA, known to cause cancer, chronic bronchitis, eye irritation when exposed to the body’s immune system. L-HISTIDINE (0.78 mg of L-histidine) – L-Histidine is a diet related ‘essential amino acid‘, also responsible for forming metal bearing enzymes (ie. metallothionein), a precursor to the allergy symptom producing hormone histamine; a synthetic form of which is added exclusively to Gardasil. ‘L-histidine supplements carry warnings that such supplements should be avoided by children, pregnant women, and nursing mothers.‘. Chemical composition: Chloride – 16.66-17.08%, Ammonium – ≤0.02% Heavy Metals (as Pb) – ≤10ppm Arsenic – ≤1ppm. Whenever a vital, naturally occurring substance such as L-histidine is injected into the body subcutaneously (alongside heavy metals, live/attenuated viruses, detergents & antibiotic excipients etc) the end result, a counter effect inevitably occurs where-in the immune system cannot differentiate between the naturally occurring amino acid in the body from that present in the vaccine; registering all these intruders as a common enemy of toxic debris. The immune system instinctively kicks into overdrive, alerting any available antibodies throughout the body to identify & eliminate deposits of L-histidine it encounters in its path. NEOMYCIN & POLYMYXIN – Neomycin & Polymixin B are antibiotics associated with Kidney failure; both hazardous to a fetus. They carry serious side effects, predominantly kidney failure. Neomycin is in the FDA pregnancy category D. This means that it is known to be harmful to an unborn baby. In the “first tier” of candidates to receive this unregistered, unapproved vaccine, pregnant women are on top of the list. Once again a case of gross negligence, endorsing the use of a toxic product in influenza vaccines recommended for Pregnant women, in light of this stern FDA warning. PHENOXYETHANOL (ANTIFREEZE) – proven to have extreme neurotoxic side effects. POLYSORBATE 80 (also referred to as Tween 80) is a type of detergent stabilizer commonly found in vaccines which is linked to infertility & severe allergic reactions (ie. anaphylaxis). Neonatal female rats were injected with Tween 80 after birth. Treatment accelerated maturation, prolonged the oestrus cycle & induced persistent vaginal oestrus. Ovaries were without corpora lutea & had degenerative follicles. ‘Neonatal female rats were injected ip (0.1 ml/rat) with Tween 80 in 1, 5 or 10% aqueous solution on days 4-7 after birth. Treatment with Tween 80 accelerated maturation, prolonged the oestrus cycle, and induced persistent vaginal oestrus. The relative weight of the uterus and ovaries was decreased relative to the untreated controls. Squamous cell metaplasia of the epithelial lining of the uterus and cytological changes in the uterus were indicative of chronic oestrogenic stimulation. Ovaries were without corpora lutea, and had degenerative follicles. POTASSIUM CHLORIDE – Used as part of a phosphate buffered saline in the shot. The majority of the potassium chloride produced is used for making fertilizer, since the growth of many plants is limited by their potassium intake. As a chemical feedstock it is used for the manufacture of potassium hydroxide and potassium metal; and as a flux for the gas welding of aluminium. Hyperkalemia. May induce Cardiac arrest (especially in renal impairment or if administered too rapidly). May cause pain and thrombophlebitis if administered in high concentration into small veins in patients with cardiac disease, renal impairment, or acidosis: monitoring of acid-base balance, potassium levels, and ECG is recommended. Potassium chloride is also used as the third of a three-drug combination in lethal injection. Additionally, KCl (AN aqueous solution form of Potassium Chloride) is used, albeit rarely, in fetal intracardiac injections in second- and third-trimester induced abortions. SODIUM PHOSPHATE DIBASIC HEPTAHYDRATE & POTASSIUM PHOSPHATE MONOBASIC: Both excipients (pharmacologically inactive substances, carriers for the active ingredients of a medication) used as part of a phosphate buffered saline in the shot. May sequester calcium and cause calcium phosphate deposits in kidneys. Chronic ingestion or inhalation may induce systemic phosphorous poisoning. Liver damage, kidney damage, jaw/tooth abnormalities, blood disorders & cardiovascular effects can result. Phosphates are slowly and incompletely absorbed when ingested, and seldom result in systemic effects. Such effects, however, have occurred. Symptoms may include vomiting, lethargy, diarrhea, blood chemistry effects, heart disturbances, nausea, vomiting, stomach/abdominal pain or bloating, dizziness, or headache and central nervous system effects. The toxicity of phosphates is because of their ability to sequester calcium. SODIUM BORATE (35 mcg of sodium borate) – Sodium borate, also known as borax, is ostensibly added as a “PH stabilizer” in vaccines. It is also a recognized toxic substance used in roach, rodent, and insect killers, antiseptics, some paints and enamels. 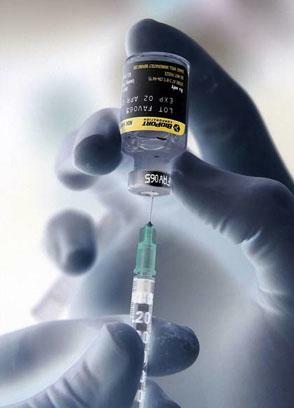 THIMEROSAL (MERCURY) – a neurotoxin linked to psychological, neurological & immunological problems. Nervous system damage, kidney disease, birth defects, dental problems, mood swings, mental changes, hallucinations, memory loss, nerve damage and inability to concentrate can occur. Symptoms also include tremors, loss of dermal sensitivity, slurred speech and, in rare cases, even death and paralysis. This additive alone was the catalyst for another recent Class Action Lawsuit organized by mothers of children born with Autism & the many related behavioral disorders associated with it. Autism is now occurring at levels never seen before in history, 1 in 67. The average used to be 1 in 20,000. Thimerosal Mercury is added to vaccines ostensibly to sterilize the giant multi-dose vats containing the serum. Studies have shown that the level of mercury in the umbilical cord blood of newborns is 1.7 times higher than the mercury level in their mother’s blood. Eating fish just two or more times a week has been found to raise mercury levels seven times beyond those in women who had not eaten any fish for a month, according to the CDC. While Thimerosal Mercury contained in vaccines gets absorbed into the Placenta interfering with early development. There is also a myth, perpetrated by the Vaccine Industry, suggesting the alternative use of a muted or heat-treated virus negates any direct infection of the immune system. ‘Attenuated or killed vaccines are not dead or neutral, since they must retain immunising power if they are to produce a reaction from the immune system. Their active principle is therefore to cause disease and insofar as the sought-after effect is to provoke the malady, vaccines represent a traumatizing jolt to the organism.’ Whether you’re receiving a live virus or so called “dead strands of RNA/DNA”, the adjuvant accelerates any lessening which may occur in tempering down the original virus. It is, in essence, super-charged, re-ivigorated by the metal salts or Squaline otherwise added to the concoction; generating a robust immune response. Immune suppression has everything to do with point of entry into the body; in addition to the timing of exposure to these toxic elements. As mentioned in part one of this article, the vast majority of infections enter the body through the nasal passages & the Gastro-Intestinal Tract or the guts. Accordingly 80% of the body’s immune system is stationed at these junctures – the first line of defence. Vaccines are injected into deep muscle tissue, a route which literally bypasses one’s natural defences altogether. Inadvertently, heavy metals & live viruses that would otherwise be sequestered & chelated out of the body, will unnaturally accumulate in the bloodstream. The very young (babies and small children) are at a high risk because their brains are undergoing the most rapid development at the very time they receive the greatest number of vaccinations. Early onset autism occurs anywhere from 12-18 months, potentially even earlier. It is significant that autism coincides precisely with most intense period of standard immunization. According to the CDC’S ‘Recommended Immunization Schedule for Persons Aged 0 Through 6 Years—United States • 2010′ by 15 months the average child has received 25 injections including: 3 doses of Hepatitis B, Rotavirus, HIB (Haemophilus Influenzae Type b), IPV (Inactivated Polio Vaccine) & Hepatitis A, 4 doses of DPT (Diphtheria, Pertussis, Tetanus) & PCV (Pneumococcal Conjugate Vaccine), 1 dose of Varicella & Meningococcal and 2 doses of MMR (Measles, Mumps, Rubella). ‘It is well known and published in the scientific literature that combinations of two chemicals may be 10 times as toxic as either separately, or 3 chemicals 100 times as toxic…The levels of mercury Thimerosal in vaccines has been shown to be highly neurotoxic, but the effect was found to be much larger due to the synergistic effect with aluminum, which is also in most vaccines. “All trace minerals, metals, inorganic materials, proteins and amino acids are held in suspension in liquids as microscopic and submicroscopic particles like dust particles in the air. The very small particles are called colloids. Colloids are held in suspension via a very slight electronegative charge on the surface of each particle. This charge is called a Zeta Potential. The ability of a liquid to carry material in suspension is a function of these minute electrical charges. As the electronegative charge increases, more material can be carried in suspension. As the charge decreases the particles move closer to each other and the liquid is unable to carry the same amount of materials. Calcium and heavy metals drop out first, adhering to the vessel wall or organ surface. Aluminum + Thimerosal = twice the toxic overload – ‘Mercury readily combines with aluminium to form a mercury-aluminium amalgam when the two pure metals come into contact. A small amount of mercury can “eat through” a large amount of aluminium over time, by progressively forming amalgam and relinquishing the aluminium as oxide.’ Whereas Aluminum is the more dominant metal as a coagulant & in terms of its net charge on the body, Mercury is clearly the more corrosive element. Even if you’ve already received numerous vaccines you can still purge a lot of the damage done. Start with Vitamin D3, Niacin, Omega 3 Fatty Acids, Selenium, Vitamin C, Colloidal Silver, Oil of Oregano, Coconut Oil, Noni Juice, Magnesium, Zinc, Curcumin, Spirulena, Activated Charcoal, Chlorella, Zeolite Powder & Cilantro (last 4 absorb heavy metals accumulated in the body). I would also recommend adding organic Kale, Celery & Beets, Red Grapes with seeds & Apples (both eaten whole) to your diet. A daily swig of Organic Apple Cider Vinegar is also vital to help restore the Alkaline balance in your body. This list is really just a primer for total health regeneration. There are more steps to take but this is the road that will ultimately begin the natural process; a gathering of all the material I’ve found useful along the way gleaned from multiple sources. Find creative ways to add it to your regime. You can do this. Time to be proactive!!! I’m a little confused. You mention neomycin toxicity but say it’s found in this vaccine marketed to pregnant women. It’s not clear to me which vaccine you are speaking of? I know Neomycin and polymyxin are found in the IPV vaccine, but that one is not being pushed on pregnant women. I just realized you are speaking of the flu vaccine. I had no idea neomycin was in this vaccine and I am allergic to it. I’ve been getting the flu vaccine every year because I am a health care worker and it is mandated. This concerns me.